Phyllis Barron (1890-1964) and Dorothy Larcher (1882-1952) both were trained as painters and both discovered textile printing separately in the early 1900's, Phyllis Barron in France and Dorothy Larcher in India. 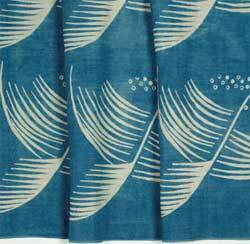 They met in London in the early 1920's where they were designing and producing printed textiles. They ultimately settled together at Parkhill Studios, Hampstead and moved to Painswick in Gloucestershire in 1930. Barron designed more abstract and geometric patterns, while Larcher created patterns inspired by botanic subjects and nature. Their partnership was particularly successful in the upper echelon of the society. They were commissioned by such celebrated names as the Duke of Westminster and Coco Chanel. 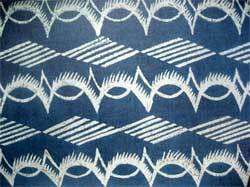 Their work has been a source of inspiration for other textile designers such as Susan Bosence.